Camu Camu, a superfruit full of Vitamine C that will reinforce your immune system! Composition: fruits of the tree. Acai Powder is a dietary supplement.
. It does not replace a varied and balanced diet.
. It is used as part of a healthy lifestyle.
. It is strongly advised not to exceed recommended doses. 1 teaspoon a day before meals, diluted in a cold drink, for periods of 2 to 3 weeks. Renew when necessary. 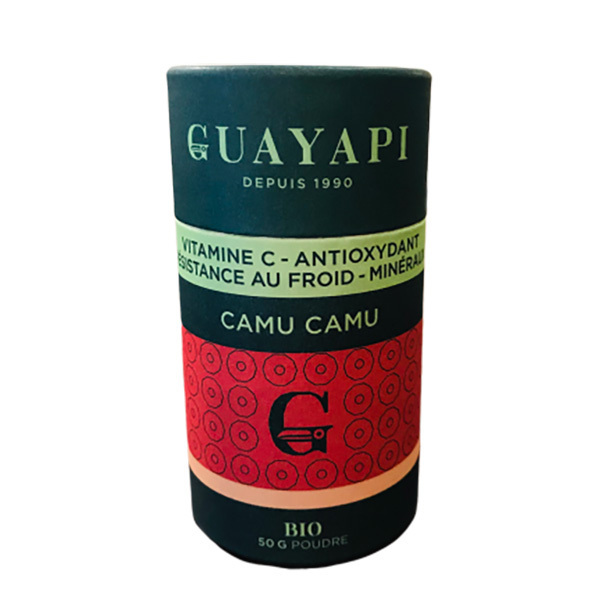 Guayapi offers a wide range of natural food supplements and cosmetics sourced from small producers in the Amazon Rainforest and the hills of Sri Lanka. Guayapi is devoted to the development and distribution of plant-based products and wild harvest work around three fundamental criteria: organic, environmental and social (fair trade). Most Guayapi products are FGP (Forest Garden Products)-certified. 1 tea spoon per day before meals in a cold drink. If used as a cure, use for 2 to 3 weeks.